The Academy’s goal is to provide convenient, high quality, yet affordable veterinary continuing education in a pleasant setting ... with five one day sessions, three in Charlottesville at Holiday Inn Monticello, One in Richmond at the Holiday Inn Express Northwest and two in Roanoke at the Holiday Inn Valley View plus one weekend conference at a low registration fee, the Colonial Veterinary Conference in Williamsburg VA. The cost of annual membership is only $275 for veterinarians and $150 for technician/support staff, with multi member prorated discounts for each. This entitles each member to attend all the one day meetings at no charge and the weekend conference at a fee of $150 each. If you are unable to attend the one day meetings, notes will be available at www.vetmeetings.com . Proceedings books available at cost only at weekend conferences. Each of the one-day meetings held in March, April, May, September, October and November and carries six hours of Continuing Education and the weekend meeting conference carry 20 hours of continuing education credits. 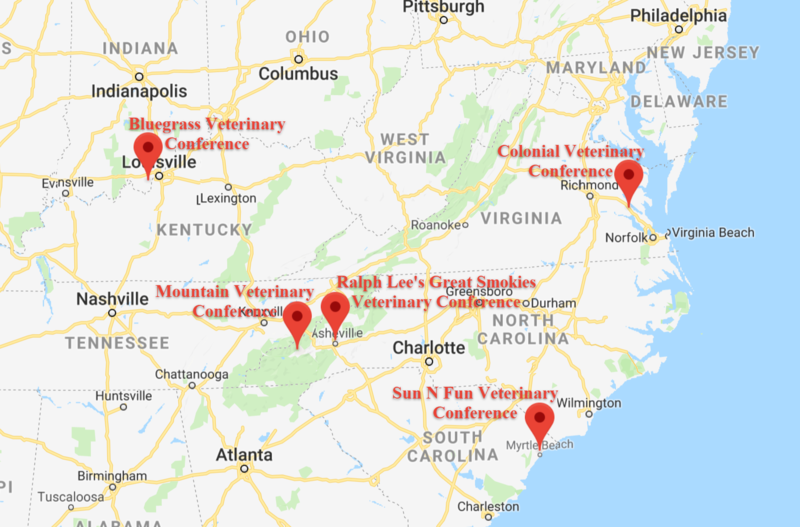 Membership entitles you to attend these weekend conferences at a reduced registration fee of $150 each and NCCAA’s 1st flight Veterinary Conference at half the regular registration fee. Practical strategies move our practices and profession toward a more fear-free and stress-free experience. The benefits go far beyond the individual patient, bringing value and quality to our lives. How Can We Help, Unless We Know How They Hurt? We recognize the need to assess acute and chronic pain in animals in all areas of clinical veterinary care. Assessment of pain in animals has relied largely on observation of complex behaviors. Quantitative, objective, practical assessment is a long-standing goal that we are finally approaching. Old standbys, newly available analgesics, novel methods, and local anesthetics have greatly expanded our options. The opioid shortages, as well as other contemporary factors, increase emphasis on other components of multi-modal analgesia. We’ll summarize significant details that influence best methods. This can change your practice and add substantial value in surgical cases. We give potentially lethal drugs to patients with serious injury and debilitating illness. We are rightly apprehensive, but now successfully manage many patients who would not have had a reasonable chance just a few years ago. We’ll include case-based discussion of potential problems for high-risk patients. Problem-based case management reduces morbidity and mortality for our patients and importantly reduces stress in our hospitals every day. Although age is not a disease, we do see increased co-morbidities and limited resilience in our older patients. Best practices for these animals include use of readily available agents and techniques. Increased attention to detail and a respect for the fragile homeostasis brings clinical success and client appreciation. Things can go wrong. Through case examples, we’ll discuss commonly encountered anesthetic emergencies and complications, how to recognize developing problems, how to turn around a problem situation so early that a crisis is averted, and how best deal with an anesthetic emergency or complication. Ralph Harvey, DVM, MS, Diplomate ACVAA, retired from the University of Tennessee College of Veterinary Medicine in Knoxville, Tennessee, where he taught anesthesia and pain management in the Department of Small Animal Clinical Sciences from 1985 until 2018. He served as the Section Head for the Small Animal Surgical Services and as a member of the University Faculty Senate. His veterinary degree is from the UTCVM. His graduate study was at the University of North Carolina, Chapel Hill and at the National Institute of Environmental Health Sciences. His post-DVM graduate training included internship, residency, and fellowship at Cornell&#39;s Veterinary and Medical Colleges. Dr. Harvey also worked in private small animal practice. He is certified as a specialist by the American College of Veterinary Anesthesia and Analgesia, has served as their Executive Secretary and as a member of the ACVAA Board of Directors. He is currently a member of the Fear-Free Advisory Panel and the Fear Free Executive Council. He received the UTCVM Brandy Memorial Award, the Outstanding Faculty Member Award from the Tennessee VMA, and the UTCVM Outstanding Alumni Non-Practice Career Award. FELINE VIRAL UPPER RESPIRATORY DISEASE…Why it Persists! 4 - Therapeutic use of dietary oils - fish oil, MCT oil, etc. 6 - Gastrointestinal diets - what are they and when should you use them?